There are three separate classes of vehicular circulation on campus. These relate to parking access, service and delivery access, and circulation by maintenance staff. A fourth category is emergency vehicle access. An objective of the campus master plan is to accommodate all of these movements safely and with minimal conflict with those on foot. Another objective is to make vehicular circulation and parking safe and convenient yet inconspicuous. The existing system of circulation routes falls short of both of these objectives. 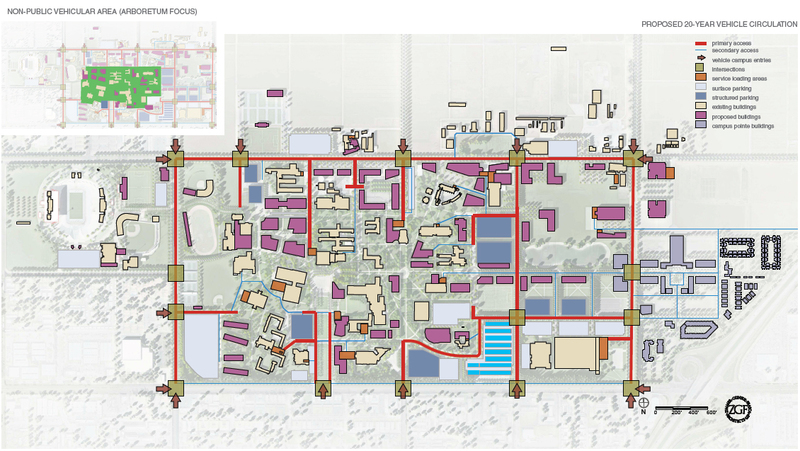 The campus has become dominated by motor vehicles and vehicle access routes. 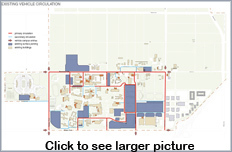 Our premise is to control the use of motor vehicles within the confines of the campus, restricting their use to locations of necessity, such as loading and unloading bays, and to develop a motor vehicle access plan that will minimize existing conflicts between pedestrian and bicycle users and delivery vehicles that occur on the streets and walkways of the campus. Improvements will be related to associated building projects, so will take many years to complete. Within ten years, improvement associated with the new main entrance off Shaw and the parking garages on lots J and K can be anticipated. Safe and congenial circulation on foot between the many destinations on campus demands the removal of current conflicts with vehicular movements. 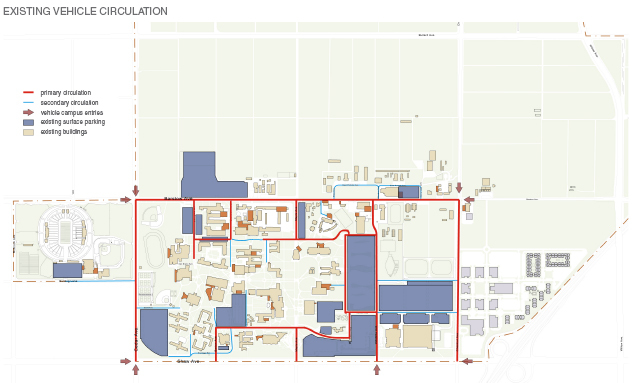 The plan shows a rerouting of service and delivery vehicles using a series of cul-de-sac routes from the perimeter of the campus to the various service entrances to buildings. Conflicts with pedestrian circulation routes would not be removed entirely, but will be substantially reduced. Removal of parking lots from the interior of the campus to lots and structures on its perimeter will remove access traffic entirely (for example, Lot D will be replaced by buildings and open space following construction of the library parking garage). Maintenance vehicles will continue to use whatever access routes are open to them, so the emphasis will be on use of vehicles that are no more intrusive into the pedestrian environment of the campus interior than is strictly necessary.